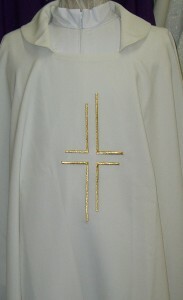 This chasuble (with stole) , made in Italy, comes in the 4 seasonal colours of green, purple, red and white. It is very light in weight. Please be advised that we may not always have stock, on hand, of all the seasonal colours. Therefore, if you are interested in a particular colour, and it is not currently available for on-line purchase, please contact us by email or telephone to confirm availability and to place an order.